This is a gorgeous soft cotton razor cut hand embroidered peace symbol cross shoulder bag handcrafted by our skilled artisan of Nepal. It has a heavy duty zipper and a rope to tie to from outside to make this bag more secure. This bag has a inner pocket with zipper also to keep smaller items. The soft cotton makes it feel nice and cozy and the fully lined heavy cotton fabric makes this bag more durable. It has a long and wide strap that keeps the bag rest on the hip to carry easily and comfortably. These bags are individually hand crafted so each piece is unique and color may vary slightly. The shoulder strap measures approximately 3.0" wide and 22" long. This bag is exclusively made for Agan Traders. 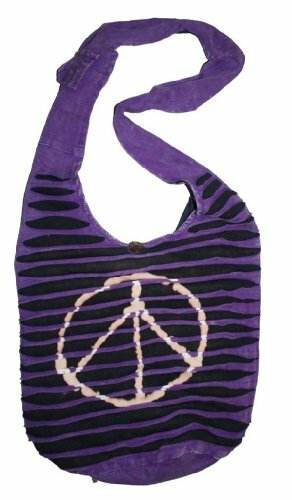 Gorgeous heavy duty soft cotton embroidered peace symbol vibrant color bag. Bags closes by zipper and a rope tie with inner pocket and zipper. For everyday and every occasion to use. If you have any questions about this product by Agan Traders, contact us by completing and submitting the form below. If you are looking for a specif part number, please include it with your message.